There has been a vast scale improvement in exports of India since last few years. This has been largely due to policies introduced by the government to promote Ease of Doing Business in the country. There were over 100+ policy schemes for businesses and start-ups of which Government initiated and simplified procedures for business incorporation, facilitation of credit and claiming of business licenses for newly built enterprises made a hand go process. The performance is even more commendable when compared with exports made by MSME entities in India of processed foods, leather goods, engineering goods, and ready-made garments. In view to upscale facilities for export-oriented centers, the MSME sector now receives preferential treatment from the government. Numerous incentives have been planned and offered by the government to these MSME entities like market development fund, infrastructure development fund, simplification of duty drawback rules, etc. Also, certain compliances have also been simplified for MSME entities for applying new business registration and license approvals for exports. But what all documents do MSMEs require to obtain an export license in India? MSME (Micro, Small and Medium Enterprises) to avail benefits of government schemes proposed for export-oriented units have to get themselves registered online and obtain certain certifications. One such certifying document is an approved Udyog Aadhaar Memorandum (UAM) of business issued by the Ministry of MSME. Furthermore, DSC (Digital Signature Certificate) of applicant and details of PAN Card (apply one in business name if not a sole proprietorship) and Bank Account of business are also necessary to apply for an export license. Where Udyog Aadhaar comes in a picture? Udyog Aadhaar Memorandum (UAM) is a 12 digit identity number issued to MSMEs to register under the MSMED Act 2006, useful for availing various tax exemptions and credit schemes of government. 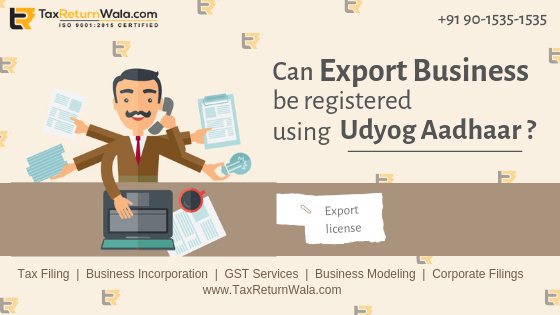 For obtaining an export license online, an MSME has to mandatory submit PAN details, Banks details, and details of necessary licenses obtained by the entity from the government through its Udyog Aadhaar Memorandum. With Udyog Aadhaar one can apply for current bank account opened in name of the business, if registered as MSME and can opt it as a registered proof of business for obtaining an export license from the government. MSME Export License – How To Apply? Step 1: Obtain PAN and Bank Account number of Business using Udyog Aadhaar and necessary documents as prescribed. Step 2: Locate to http://164.100.78.104:8080/dgftiec/panSearch.jsp and enter PAN details to proceed. Step 3: File in details of applicant and business under all respective heads and upload all necessary documents. Step 4: Make payment of fees. Step 5: Submit your application authorizing it through DSC. On completion, within 24 or 48 hours, a communication on successful application or rejection (along with reasons therein) shall be sent by the department on the official email account or through provided phone number of the applicant. Merchandise Exports from India Scheme (MEIS): To provide infrastructural facilities and tariff exemptions to MSME exporters. Status Holder Recognition Scheme: To grant special privileges to the entity under Foreign Trade Policy to avail facilities like recognition as a legal entity in lieu of bank guarantee, a facility for free of cost exports for export promotion, etc. Interest Equalization Scheme: To provide affordable credit facilities to MSME exporters. Niryat Bandhu Scheme: To mentor MSME exporters on changing policies of global markets, conduct counseling sessions, individual facilitation, etc. With a view to expand global market reach for MSME exporters the following schemes were also proposed – Export Promotion Capital Goods (EPCG) Scheme, Duty Exemption/Remission Schemes, Advance Authorisation (AA), Duty Free Import Authorisation Scheme (DFIA), Duty Drawback Scheme (DBK), Advance Procurement/ Replenishment of Precious Metals from Nominated Agencies, Scheme for Replenishment Authorisation for GeM from MSME . Udyog Aadhaar directs through an integral part of the whole process of obtaining Import Export License (IEC) by MSME exporters. It further helps in availing numerous schemes and offers of government issued for MSME exporters. Need assistance on MSME Registration online or obtaining an Export License?